Gastric cancer is the third most common malignancy affecting the general population worldwide. 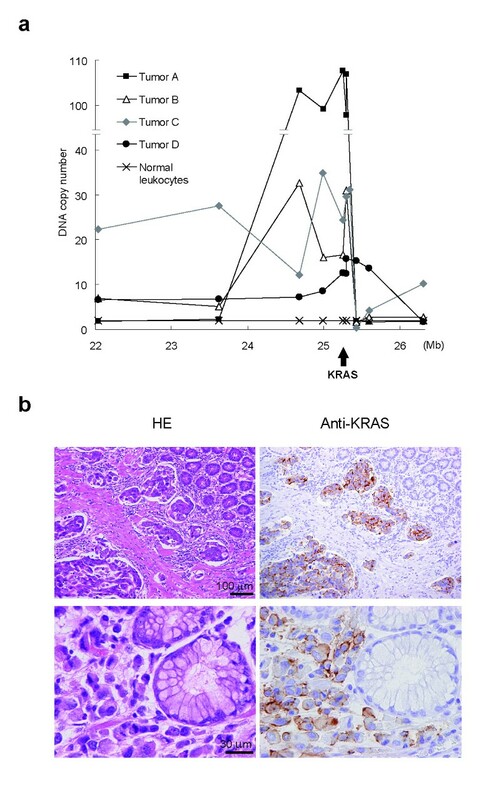 Aberrant activation of KRAS is a key factor in the development of many types of tumor, however, oncogenic mutations of KRAS are infrequent in gastric cancer. We have developed a novel quantitative method of analysis of DNA copy number, termed digital genome scanning (DGS), which is based on the enumeration of short restriction fragments, and does not involve PCR or hybridization. In the current study, we used DGS to survey copy-number alterations in gastric cancer cells. DGS of gastric cancer cell lines was performed using the sequences of 5000 to 15000 restriction fragments. We screened 20 gastric cancer cell lines and 86 primary gastric tumors for KRAS amplification by quantitative PCR, and investigated KRAS amplification at the DNA, mRNA and protein levels by mutational analysis, real-time PCR, immunoblot analysis, GTP-RAS pull-down assay and immunohistochemical analysis. The effect of KRAS knock-down on the activation of p44/42 MAP kinase and AKT and on cell growth were examined by immunoblot and colorimetric assay, respectively. DGS analysis of the HSC45 gastric cancer cell line revealed the amplification of a 500-kb region on chromosome 12p12.1, which contains the KRAS gene locus. Amplification of the KRAS locus was detected in 15% (3/20) of gastric cancer cell lines (8–18-fold amplification) and 4.7% (4/86) of primary gastric tumors (8–50-fold amplification). KRAS mutations were identified in two of the three cell lines in which KRAS was amplified, but were not detected in any of the primary tumors. Overexpression of KRAS protein correlated directly with increased KRAS copy number. The level of GTP-bound KRAS was elevated following serum stimulation in cells with amplified wild-type KRAS, but not in cells with amplified mutant KRAS. Knock-down of KRAS in gastric cancer cells that carried amplified wild-type KRAS resulted in the inhibition of cell growth and suppression of p44/42 MAP kinase and AKT activity. Our study highlights the utility of DGS for identification of copy-number alterations. Using DGS, we identified KRAS as a gene that is amplified in human gastric cancer. We demonstrated that gene amplification likely forms the molecular basis of overactivation of KRAS in gastric cancer. Additional studies using a larger cohort of gastric cancer specimens are required to determine the diagnostic and therapeutic implications of KRAS amplification and overexpression. Gastric cancer is the third most common malignancy affecting the general population worldwide . Specific genetic changes have been reported in gastric cancer, including the amplifications of KSAM, MET and ERBB2, and mutations in p53, APC, and CDH1 . While gain-of-function mutations of KRAS are some of the most commonly observed genetic alterations in a variety of tumors, including pancreatic (60%), biliary tract (33%) and colon (32%) , these mutations are infrequent in gastric cancer (2–7%) [4–7]. In general, RAS mutations associated with tumorigenesis "lock" RAS in an active GTP-bound state. GTP-RAS binds to a number of effector proteins to stimulate downstream signaling pathways, among which the RAF-MAP kinase cascade and the phosphatidylinositol 3-kinase (PI3K)-AKT pathways of cell growth and oncogenesis are the best characterized . Prolonged activation of RAS can also occur through mechanisms that do not involve mutations in RAS. For example, reduced expression of let-7 microRNAs, which suppresses RAS by targeting the 3'untranslated region of RAS mRNAs, is often associated with a higher RAS protein level in tumors . To date, the molecular mechanisms of oncogenic activation of RAS in gastric cancer have not been fully elucidated. Amplification of genomic sequences containing genes that are critical for cell growth is one of the primary mechanisms of activation of oncogenes in cancer, and is often associated with tumor progression, poor prognosis and/or drug resistance . Of the numerous methods currently available for detecting copy number alterations genome-wide, the current gold standard is the array CGH method (aCGH). Over the past few years, the resolution of aCGH has improved rapidly through the use of oligonucleotide probes, and has surpassed that of aCGH using standard BAC probes . However, aCGH is also susceptible to the inherent noise of hybridization-based intensity measurements, as the signal quality is affected by repetitive sequences and is dependent on probe quality . In fact, optimization of probe design has been a major challenge in the development of tiling arrays [12, 13]. Digital karyotyping (DK) was developed by Wang et al. , and is not limited by the inherent problems of array techniques. DK involves the digital enumeration of short fragments of genomic DNA (termed tags), providing a quantitative measurement of DNA copy number through tag density analysis along each chromosome. DK has been applied successfully to a variety of tumor types to detect copy-number alterations, including the amplification of TYMS, RSF1 and OTX2, and deletion of MKK4 and dystrophin [15–19]. Despite the efficiency of DK, it is technically challenging for broad applications, because it involves PCR amplification and the generation of tags of 21-base pairs (bp) in length to precisely represent the chromosome location of interest. We report here the development of a novel method, termed DGS, for the quantitative analysis of copy number variation, which is based on the tag-counting concept of DK, but uses a simplified process of tag preparation. DGS of gastric cancer cell lines detected the amplification of the KRAS locus on chromosome 12p12.1. Our results provide a molecular basis for the overactivation of KRAS, and suggest that the activation of KRAS downstream signaling events may promote gastric cancer cell proliferation. The cell lines analyzed in the current study are listed in Additional file 1. The HSC and SH101P4 cell lines were established by Kazuyoshi Yanagihara ; all others were obtained from American Type Culture Collection or the Japanese Collection of Research Bioresources (Tokyo, Japan). All cell lines were cultured in the recommended media. For serum stimulation, cells were incubated in media that lacked serum for 24 hours (h), and then either unstimulated, or stimulated for 1 h with media containing 10% fetal calf serum (FCS). Primary gastric cancer specimens were obtained from the Department of Surgery, Keiyukai Sapporo Hospital, with informed consent from each patient. Genomic DNA was extracted using the phenol-chloroform method, followed by RNase treatment. Total RNA was extracted using Trizol (Invitrogen, Carlsbad, CA, USA), according to the manufacturer's instructions. Genomic DNA of normal peripheral blood leukocytes (Biochain, Hayward, CA, USA) and total RNA from normal gastric mucosa from healthy individuals (Biochain and Invitrogen) were purchased. Primary gastric cancers were classified using clinicopathological features, as shown in Additional file 2, according to the pTNM classification scheme (5th edition, 1997)  and the Lauren's classification system . KRAS-amplification status according to age was compared using the Student t test; according to grade, pT status, pN status, and disease stage using the Mann-Whitney U test; and according to gender, histology and pM status using the Fisher exact test. All tests were 2-tailed, and a P value of < 0.05 was considered statistically significant. Briefly, 40 μg of genomic DNA were subjected to restriction enzyme digestion using MboI (Takara, Tokyo, Japan) and then separated by electrophoresis on a 3% Nusieve GTG agarose gel. Short fragments (30–60 bp, termed real tags) were electroeluted, concatenated and subcloned into BamHI-digested pBluescript II KS+ (Stratagene, La Jolla, CA) using Mighty Mix DNA ligation solution (Takara). Escherichia coli DH10B were transformed with the recombinant plasmids, the transformants were pooled and the plasmid DNA was purified to generate the 1st library. Concatemers of real tags were excised by SpeI/PstI digestion from the 1st library, and fragments in the range of 140 to 800 bp were electroeluted, concatenated and subcloned into pBluescript II KS+ to generate the 2nd library. Second library plasmids containing concatemers of SpeI/PstI fragments were sequenced using an ABI3130 Genetic Analyzer (Applied Biosystems, Foster City, CA, USA), according to manufacturer's instructions. Unique real tags were mapped to human chromosome sequences, and tag density, defined as the ratio of real tags to virtual tags over moving windows, was calculated to detect abnormalities in DNA content using threshold values defined by DGS simulations. Tag positions and tag density ratios were visualized using Custom Tracks and Genome Graphs from the University of California, Santa Cruz (UCSC) genome browser (Mar. 2006 freeze, hg18) [23–25]. The detailed protocols for DGS, virtual tag characterization and in silico simulations are available in Additional file 3. Relative DNA copy number was determined by quantitative real-time PCR using a SYBR Green PCR Master Mix (Applied Biosystems) and the ABI PRISM 7000 (Applied Biosystems). DNA content per haploid genome was normalized to that of a repetitive element, Line-1, and calculated by the comparative CT (ΔΔCT) relative quantification method using the formula 2(Nt - Nline)-(Xt - Xline), where N t is the threshold cycle number observed for an experimental primer in normal leukocyte DNA, N line is the threshold cycle number observed for the Line-1 primer in normal leukocyte DNA, Xt is the average threshold cycle number observed for the experimental primer in cancer cell DNA, and X line is the average threshold cycle number observed for the Line-1 primer in cancer cell DNA . Genomic amplification was defined as a greater than 4-fold increase in DNA content. The primer sequences for each locus are available in Additional file 4. The allelic proportion of mutant KRAS (G12V, ggt→gTt) was determined by employing a modified real-time PCR procedure according to Itabashi et al . The detailed protocol is available in Additional file 3. cDNA was prepared using SuperScript III reverse transcriptase (RT, Invitrogen), and the mRNA level of each gene was determined by real-time RT-PCR using the TaqMan Gene Expression Assay (Applied Biosystems). Relative mRNA levels were calculated by the comparative CT method using GAPDH as an endogenous control. The primer/probe sets used are shown in Additional file 5. BACs that contained the KRAS locus (RP11-636P12) and chromosome 12q24.2 (RP11-91M21) were labeled with Cy3 and Cy5, respectively, and then incubated with slides prepared with interphase and metaphase chromosomes. Nuclei were counter-stained with 4',6-diamino-2-phenylindole (DAPI), and slides were analyzed using a fluorescence microscope (Leica CW-4000). Amplified genomic fragments were either sequenced directly, or subcloned using the TOPO TA-cloning kit (Invitrogen) and then sequenced. At least ten clones from two independent PCR assays per locus were sequenced using M13 Forward and Reverse primers (Invitrogen). The sequences of the primers used for amplification of KRAS (exons 1 and 2) and PIK3CA (exons 9 and 20) are shown in Additional file 6. Cells were lysed in Lysis buffer containing 20 mM Tris-HCl (pH7.5) buffer, 150 mM NaCl, 1 mM EDTA, 1% Triton X, 10% glycerol, 10 mM NaF, 1 mM sodium vanadate, 50 mM β-glycerophosphate, 1 mM phenylmethansulfonyl fluoride, 1 mM dithiothreitol, and a protease inhibitor cocktail (Roche, Mannheim, Germany). Proteins were separated by SDS-PAGE and electroblotted onto an Immobilon-P membrane (Millipore, Billerica, MA, USA). The membranes were analyzed by immunoblot using the following antibodies, as indicated: mouse monoclonal anti-KRAS, -NRAS, and -HRAS antibodies (sc-30, sc-31, and sc-29, respectively, Santa Cruz Biotechnology, Santa Cruz, CA, USA); anti-actin antibody (Millipore); rabbit polyclonal anti-p44/42 MAP kinase, -phosho-p44/42 MAP kinase (Thr202/Tyr204), -Akt and -phospho-Akt (Ser473) antisera (Cell Signaling Technology, Danvers, MA, USA). The activation of RAS was detected using an EZ-Detect Ras Activation Kit (Pierce, Rockford, IL, USA). Briefly, cell lysate (500 μg) was incubated with immobilized Raf1 Ras-binding domain fused to glutathione S-transferase (GST-Raf1-RBD). Precipitates were washed 3 times, and bound proteins were eluted by boiling for 5 minutes (min). Proteins were resolved on a 12% polyacrylamide gel, transferred to an Immobilon-P membrane, and subjected to immunoblot analysis using anti-KRAS, -NRAS, or -HRAS antibodies. A custom-designed KRAS siRNA (5'-AGAGUGCCUUGACGAUACAdTdT-3'), targeting a region of KRAS that is not associated with known oncogenic mutations, was synthesized by Dharmacon (Lafayette, Co, USA). siRNAs targeting LRMP, LYRM5 and CASC1 were purchased from Ambion (No.144181, 284911 and 147715). A universal non-targeting siRNA (non-specific control VII, Dharmacon) was used as a negative control. In each experiment, 5 × 106 cells were transfected with 7.5 μl of 20 μM siRNA by electroporation (Amaxa, Cologne, Germany) using Nucleofector kit V or T, according to the manufacturer's instructions. 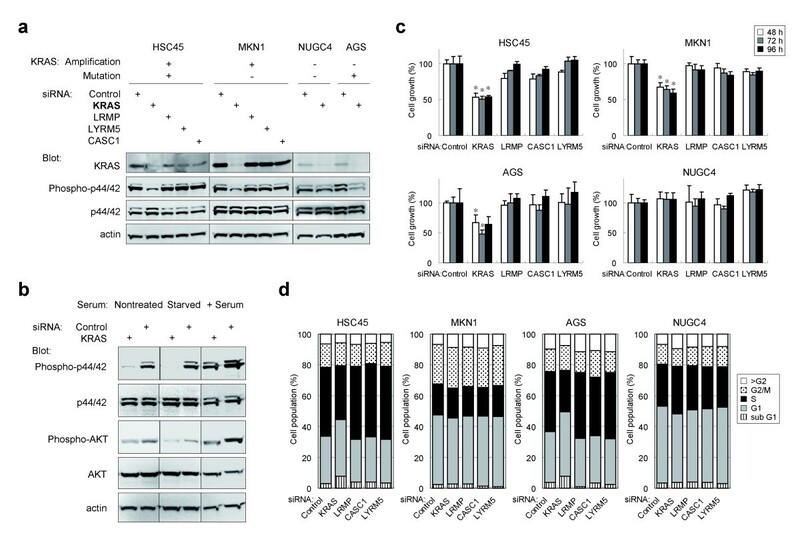 Following transfection with siRNAs, the gastric cancer cell lines HSC45, MKN1, AGS and NUGC4 were seeded in 96-well plates at a density of 8000 cells/100 μl in standard medium containing 10% FCS. Cell number at 48, 72 and 96 h post-transfection was determined indirectly by colorimetric assay using Cell Counting Kit-8 solution (Dojindo, Kumamoto, Japan). The assay is based on the reduction of a tetrazolium salt ([2-(2-methoxy-nitrophenyl)-3-(4-nitrophenyl)-5-(2,4-disulfophenyl)-2-tetrazolium, monosodium salt], WST-8) and is used as a measure of live cells. The absorbance of each well at 450 nm was measured using a microplate reader (Model 680, Bio-Rad, Hercules, CA, USA). Flow cytometry was carried out as described previously . Briefly, adherent and detached cells were harvested, fixed in 90% cold ethanol, treated with RNase A (500 units/ml), and then stained with propidium iodide (50 μg/ml). For each sample, 30000 events were analyzed using the cell cycle analysis platform of FlowJo program (Tree Star, Ashland, OR, USA). Formalin-fixed, paraffin-embedded sections of gastric tumors were deparaffinized, hydrated, and then treated with peroxidase blocking solution (3% H2O2 in Methanol). Sections were autoclaved at 105°C for 10 min in target retrieval solution (Dako, Glostrup, Denmark). Sections were incubated with a mouse anti-KRAS antibody (1:100 dilution; Santa Cruz Biotechnology) for 1 h at room temperature, and immunoreactivity was detected using ENVISION-Plus reagents (Dako). 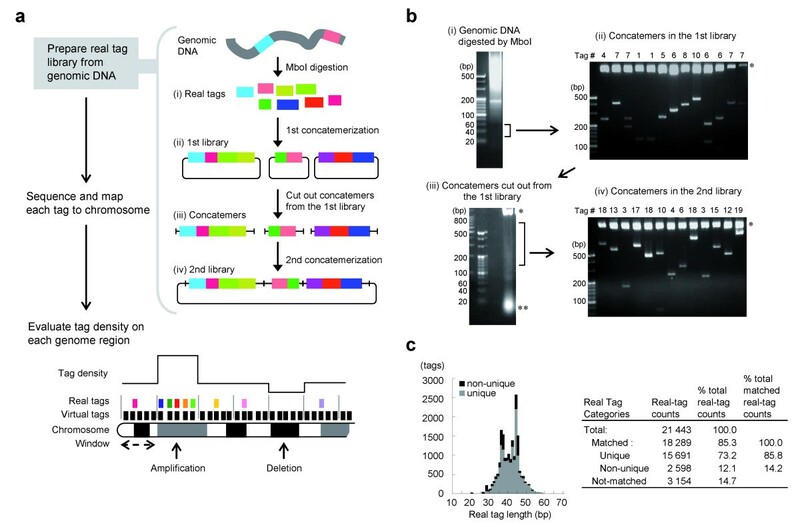 Digital genome scanning (DGS) is a method of quantitating gene copy number by enumerating short genomic DNA fragments (termed real tags) that are generated experimentally by MboI endonuclease digestion (Figure 1a). To eliminate the complicated steps involved in tag preparation, we computationally characterized the short DNA fragments that are produced by single restriction enzyme digestion with MboI, which recognizes the 4-bp sequence GATC. In silico digestion of the human genome by MboI produced approximately 1.6 million restriction fragments (termed virtual tags) in the range of 20–130 bp (Additional file 7a). Nucleotide sequence analysis revealed that approximately 65% of the virtual tags contained repetitive sequences, as defined in the public database of repeat elements (Additional file 7a). Importantly, sequence matching to the human genome database revealed that approximately 85% of the virtual tags mapped uniquely to precise chromosomal locations (Additional file 7b, c). Even if the virtual tags include repetitive sequences in part, approximately 80% of the repetitive tags turned out to be unique. The average distance between two unique virtual tags of 30 to 60 bp in length was 7.6 kb, the median distance was 4.5 kb and 97.8% of intervals were shorter than 30 kb (Additional file 7d). Similar tag interval characteristics were observed for virtual tags the range of 70 to 100 bp (average distance, 7.9 kb; median distance, 4.8 kb; 97.4% were shorter than 30 kb), and 100 to 130 bp (average distance, 7.9 kb; median distance, 4.9 kb; 97.4% were shorter than 30 kb (Additional file 7e, f). Furthermore, the density of unique virtual tags was nearly equal in each chromosome (Additional file 7g). These in silico findings suggested that the majority of short MboI tags would be informative for DGS. DGS and preparation of real tags. (a) Schematic outline of DGS. Colored boxes represent genomic MboI real tags. See text for details. (b and c) Preparation (b) and characterization (c) of real tags. 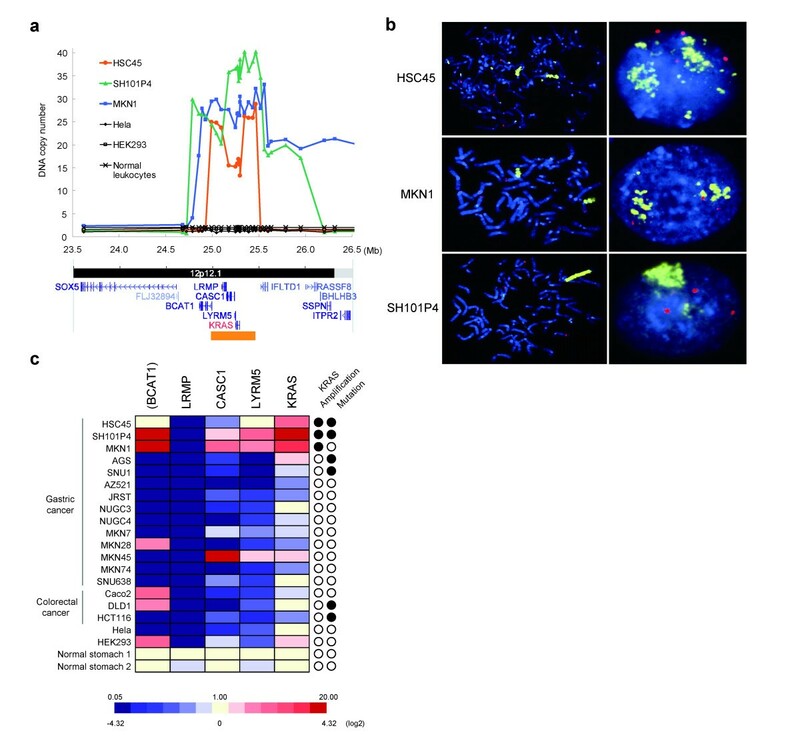 Representative results using genomic DNA from MKN1 gastric cancer cells are shown. (b) Short fragments of MboI-digested genomic DNA (30 to 60 bp) were electroeluted from an agarose gel (i), concatenated and subcloned. Resultant recombinant plasmids were pooled to generate the 1st library (ii). Long concatemers (140 to 800 bp) were excised from 1st library vectors, electroeluted (iii), concatenated and subcloned. The resultant recombinant plasmids represent 2nd library clones (iv). The number of tags contained in each clone is shown at the top of each lane. Inserts were examined by XhoI/SacI digestion in panels (ii) and (iv). *, vector fragments; **, SpeI/PstI digestion of the multiple-cloning site without insert. (c) Actual number of real tags from the 2nd library is shown in the histogram (left), and their characteristics are summarized (right). The ability of DGS to detect genome-wide changes is based on genome characteristics, such as the copy number and the size of the alteration, and the number of real tags obtained from sequence analysis. To predict the size of alteration that could reliably be detected, given a fixed number of computationally sampled tags, we used Monte Carlo simulation to calculate a positive predictive value (PPV), which is the probability that a detected alteration represents a true alteration. For example, we found that an analysis of 5000 tags could reliably detect a 10-fold amplification of 500 kb, a homozygous deletion of 7.5 Mb, or a single copy loss of a 30 Mb region, but could not detect a subchromosomal gain smaller than 30 Mb (Additional file 8). Both the sensitivity and specificity of detecting these types of alteration were >99% in cases with high PPVs (>90%), which indicated that neither was a limiting factor in this analysis (data not shown). For DGS of the gastric cancer cell lines HSC45 and MKN1, we prepared libraries of real tags from genomic DNA, as shown in Figure 1a. The MboI-digested genomic DNA was size-fractionated (30–60 bp) and subjected to concatemerization, followed by construction of a 2nd library, which contained approximately 10 real tags per clone (Figure 1b). Nucleotide sequence analysis of the real tags revealed that 85.8% mapped to unique positions, which was consistent with our characterization of virtual tags (Figure 1c). The genome-wide tag density profile of HSC45 cells was determined using a total of 5,462 unique real tags. To achieve high resolution and sensitivity with the experimental data, we used window sizes of 1000 and 2100 virtual tags (approximately 2300 kb and 4700 kb) for the analysis of amplifications and deletions, respectively. The tag density ratio was calculated as the sum of real tags divided by the average number of real tags in same-sized windows throughout the genome, in which the normal tag density ratio was defined as 1.0. We identified distinct subchromosomal regions of increased tag density at 8q24.21, 12p12.1 and 12p13.33, and decreased tag density at 9p21.3 and the long arm of chromosome 18 (Figure 2, Additional file 9a-d). The regions of increased tag density (12p12.1, 12p13.33 and 8q24.21) contained KRAS, CACNA1C (calcium channel, voltage-dependent, l type, alpha-1c subunit) and MYC loci, respectively. Southern blot analysis confirmed that KRAS and MYC were amplified in HSC45 cells (Additional file 9e). Each quantitated copy-number change as determined from quantitative real-time PCR (qPCR) of genomic DNA was remarkably similar to that estimated by DGS when the window size for tag density analysis was matched to the size of each alteration (Additional file 9a-d). These results suggest that tag density analysis by DGS could be used to perform copy number analysis throughout the human genome. Detection of increased copy number on chromosomes 8q and 12p by DGS in HSC45 gastric cancer cells. (a) A whole-genome view of the tag density ratio (using a window of 1000 virtual tags) in HSC45 cells as determined by DGS. Values on the y-axis indicate fold-changes in tag density relative to the average tag density of the whole genome, and represent DNA content per haploid genome, in windows. The x-axis represents chromosome number. (b and c) Expanded view of tag density ratios on chromosomes 8 (b) and 12 (c). In each panel, the upper graph shows a whole-chromosome view of the tag density ratio (based on a window of 1000 virtual tags). The lower graph shows an expanded view of 8q24.21 and 12p12.1, in which increased tag density was detected using windows of 1000 and 500 virtual tags. Unique real tags are indicated as black vertical bars, and unique virtual tags are indicated in blue (60 bp or shorter) or light blue (longer than 60 bp) bars in dense mode. The positions of refseq genes, with some splicing isoforms omitted, are shown at the bottom of the lower panels. Analysis of 26 loci within and immediately flanking chromosome 12p12.1 in HSC45 cells by qPCR demonstrated that a region of approximately 500 kb, which included the KRAS gene locus, was amplified (8-fold amplification, Figure 3a). Genomic qPCR screening detected KRAS amplification in two additional gastric cancer cell lines, SH101P4 (18-fold) and MKN1 (13-fold) (Figure 3a), whereas we did not detect amplification of greater than 4-fold in 17 other gastric cancer cell lines, or in 10 colon cancer and 11 pancreatic cancer cell lines (listed in Additional file 1, data not shown). DGS also detected amplification of the KRAS locus in MKN1 cells (Additional file 10). The neighboring genes of KRAS in the minimal amplicon were LRMP (lymphoid-restricted membrane protein), CASC1 (cancer susceptibility candidate 1) and LYRM5 (LYR motif containing 5). BCAT1 (branched chain aminotransferase 1, cytosolic) was also amplified in SH101P4 and MKN1 cells, but not in HSC45 cells. We confirmed that CACNA1C was amplified in HSC45 cells, but not in the other gastric, colon, or pancreatic cancer cell lines using genomic qPCR analysis (Additional file 9b; data not shown). Neither NRAS, HRAS nor BRAF amplifications were detected in the above cancer cell lines by genomic qPCR analysis (data not shown). The amplification of KRAS was also verified by dual color FISH analysis, in which the KRAS amplicon was evident as a homogeneously-stained region in HSC45, SH101P4 and MKN1 cells (Figure 3b). Gene amplification of KRAS in gastric cancer cells. (a) Quantitative genomic PCR analysis of the KRAS locus at 12p12.1 in HSC45 cells. Discrete amplifications at 12p12.1 in two other gastric cancer cell lines were also detected (SH101P4 and MKN1). DNA copy number relative to normal diploid leukocyte DNA was plotted against chromosomal nucleotide position (in megabases). The positions of refseq genes in the corresponding regions are shown in the bottom map. The minimum amplification region common to all 3 gastric cancer cell lines is represented by the orange-colored bar. (b) Metaphase (left)- and interphase (right)-FISH analysis of the amplified KRAS locus in gastric cancer cell lines. The KRAS-specific probe is in yellow, and the control probe, specific for the long arm of chromosome 12, is in red. Tetraploidy in HSC45 and triploidy in SH101P4 and MKN1 cells were observed. (c) Quantitative real-time RT-PCR analysis of KRAS mRNA expression in gastric cancer cells with 12p12.1 amplification. Expression analysis of genes (KRAS, LRMP, CASC1 and LYRM5) located within the minimal amplicon, and BCAT1, which flanks the minimal amplicon, was performed using real-time RT-PCR. Expression levels were normalized to GAPDH mRNA, and are depicted as a color gradient, relative to normal stomach. The gene amplification and mutation (codon 12 or 13) status of KRAS for each sample is summarized in the right two columns. Filled circles indicate the presence of amplification or mutation of KRAS, and open circles indicate no amplification or no mutation of KRAS. Sequence analysis of KRAS (Additional file 11a) showed that both HSC45 and SH101P4 cells harbored a mutation in codon 12 that resulted in a single amino acid substitution in KRAS (ggt→gTt, G12V), whereas MKN1 cells lacked KRAS mutations. The presence of KRAS mutations in AGS (G12D), SNU1 (G12D), DLD1 (G13D) and HCT116 (G13D) cells has been reported previously [28, 29]. Of the ten PCR-clones of KRAS from HSC45 and SH101P4 cells that were subjected to mutational analysis, eight and three, respectively, harbored mutations in codon 12. Furthermore, genomic real-time PCR analysis using probes that were specific to wild-type and mutant KRAS alleles (Additional file 11b) also revealed that HSC45 and SH101P4 cells contain different proportions of the mutant allele (80% and 50%, respectively). Overall, these results indicated that amplification of a mutant KRAS allele also occurs in HSC45 and SH101P4 cells. We next investigated the levels of KRAS mRNA in KRAS-amplified gastric cancer cells by quantitative real-time RT-PCR (qRT-PCR) (Figure 3c). The levels of KRAS mRNA correlated significantly with KRAS copy number. The neighboring genes LYRM5 and CASC1, which localized to the minimal amplicon, were also expressed at higher levels in cells with amplification as compared to cells without amplification (Figure 3c). Interestingly, LRMP was down-regulated in cancer cells as compared to normal stomach cells. 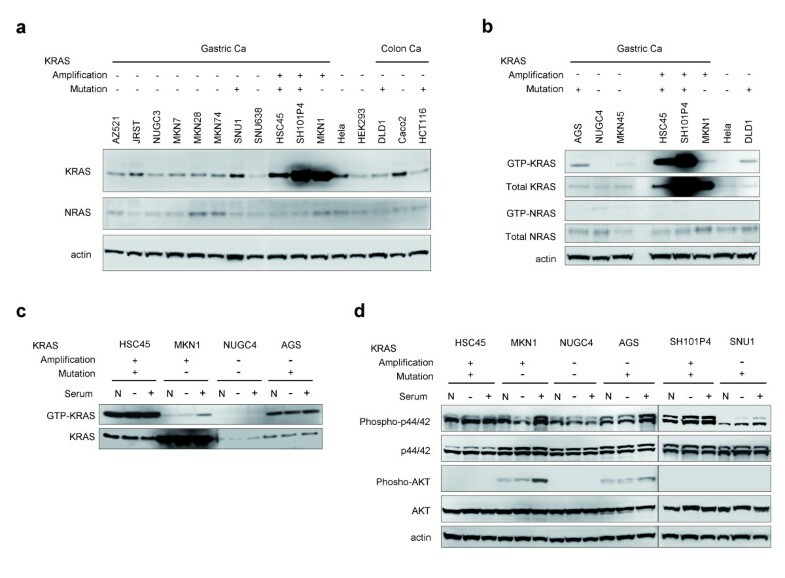 Immunoblot analysis of RAS proteins (Figure 4a) revealed that the expression of KRAS was increased in KRAS-amplified gastric cancer cells (HSC45, SH101P4 and MKN1), while neither NRAS nor HRAS were highly expressed (Figure 4a; data not shown). Although the expression of let-7c and let-7g microRNAs has been reported to regulate RAS expression , we found little correlation of expression of these microRNAs with KRAS protein levels (Additional file 12), which suggested that KRAS overexpression in gastric cancer cell lines is due primarily to genomic amplification of KRAS. Overexpression of KRAS, and differential activation of KRAS, p44/42 MAP kinase and AKT in KRAS -amplified gastric cancer cells. (a) Immunoblot analysis of the expression levels of KRAS and NRAS in cancer cells. Actin expression was analyzed as a loading control. (b) The basal level of GTP-KRAS was markedly high in gastric cancer cells with amplified mutant KRAS (HSC45 and SH101P4). Total lysate (500 μg) was subjected to a GTP-RAS pull-down assay, and GTP-KRAS and GTP-NRAS were detected by immunoblot using anti-KRAS and anti-NRAS antibodies, respectively. Total cell lysate (50 μg) was analyzed in parallel to determine the level of expression of KRAS and NRAS in cells. (c) GTP-KRAS was elevated after serum stimulation in MKN1 cells. Cells were cultured in regular medium containing 10% FCS (N), serum-starved for 24 h (-) or serum-starved then stimulated with 10% FCS for 1 h (+). Total cell lysate was subjected to a GTP-KRAS pull-down assay. (d) Activation of p44/42 MAP kinase and AKT in serum-starved or -stimulated gastric cancer cells. Total cell lysate was analyzed as described for figure c. The phosphorylation of p44/42 MAP kinase and AKT was detected by immunoblot using anti-phospho-specific antibodies. In each panel, the status of gene amplification and mutation (codon 12) of KRAS in each cell line is indicated. +, presence; -, absence. To investigate KRAS activity in gastric cancer cells, we analyzed the amount of GTP-KRAS in cells using an in vitro pull-down assay. There was a higher amount of GTP-KRAS in HSC45 and SH101P4 cells, which carried amplified mutant KRAS, than in MKN1 cells, in which the level of GTP-KRAS was comparable to AGS cells, which carried non-amplified mutant KRAS (Figure 4b). Serum stimulation had little effect on the level of GTP-KRAS in HSC45 cells, but resulted in a dramatic elevation of GTP-KRAS in MKN1 cells (Figure 4c). 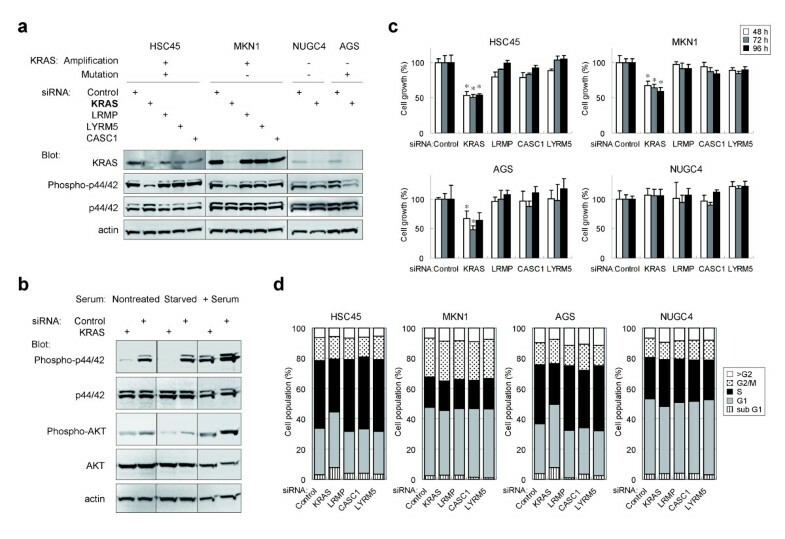 As expected, this data was consistent with constitutively active mutant KRAS overexpression due to amplification, and it suggested that overexpression of wild-type KRAS may also promote oncogenic properties when cells are exposed to external stimuli. To gain further insight into the role of overexpressed KRAS in cancer cell growth, we analyzed the activation of p44/42 MAP kinase and AKT (Figure 4d), which are pivotal molecules in the MAP kinase cascade and PI3K signaling pathways that are downstream of KRAS [3, 30]. Under normal culture conditions (Figure 4d, lanes indicated as "N"), basal phosphorylation of p44/42 was increased in KRAS-amplified cells (HSC45, MKN1, and SH101P4) as compared to NUGC4 gastric cancer cells, in which there is neither amplification nor mutation of KRAS. While the phosphorylation of p44/42 was modestly increased in MKN1 cells after serum stimulation, the effect of serum stimulation on HSC45 and SH101P4 cells was minimal, which indicated that p44/42 is constitutively active in the latter two cell lines. To investigate the biological significance of KRAS amplification in gastric cancer, we used small interfering RNA (siRNA) to knock-down the expression of KRAS or KRAS neighboring genes in four gastric cancer cell lines, HSC45 (carrying amplification and mutation of KRAS), MKN1 (amplification but no mutation of KRAS), AGS (mutation but no amplification of KRAS) and NUGC4 (no amplification or mutation of KRAS). Knock-down of KRAS and three neighboring genes was verified by qRT-PCR (Additional file 13) and KRAS immunoblot analysis (Figure 5a). While the knock-down of KRAS in HSC45 and MKN1 cells caused a marked reduction in phosphorylation of p44/42, knock-down of neighboring genes had no effect (Figure 5a, b). Phosphorylation of p44/42 was reduced in KRAS knock-down AGS cells, but not in NUGC4 cells. These results indicated that KRAS amplification is associated with both transient and constitutive activation of p44/42 MAP kinase. Suppression of downstream signaling and cell growth in KRAS -amplified gastric cancer cells by siRNA-mediated knock-down of KRAS. Cells were transfected with siRNA targeting KRAS, LRMP, CASC1 or LYRM5, or a non-targeting siRNA as a negative control. (a) KRAS knock-down suppressed the phosphorylation of p44/42 in KRAS-amplified cells. Protein levels of KRAS and activated p44/42 48 h post-transfection were determined by immunoblot using anti-KRAS and anti-phospho-p44/42 antibodies. The status of gene amplification and mutation (codon 12) of KRAS in each cell line is indicated. +, presence; -, absence. (b) KRAS knock-down suppressed the phosphorylation of p44/42 MAP kinase and AKT in MKN1 cells. Twenty-four h after siRNA transfection, MKN1 cells were cultured for an additional 24 h in regular medium (Nontreated), serum-starved for 24 h (Starved) or serum-starved then stimulated with 10% FCS for 1 h (+Serum). The activation of p44/42 and AKT was determined by immunoblot using phospho-specific antibodies. (c) Suppression of cell growth in KRAS-amplified cells by KRAS knock-down. Cells were transfected with siRNA, and cell number at the indicated time points after transfection was determined indirectly by WST-8 colorimetric assay. Data is presented as percent decrease in cell number as compared to cells transfected with control siRNA at each time point, and represents the means and SD for triplicate cultures. Statistical analysis was performed using the unpaired t-test. *, P < 0.005 relative to the siRNA control. Data is representative of two independent assays. (d) KRAS knock-down decreased the fraction of HSC45 and AGS cells in S-phase. Cells were analyzed by flow cytometry 48 h post-transfection. Data is representative of two independent assays. Basal phosphorylation of AKT was detected under normal culture conditions, and was increased after serum stimulation of MKN1 and AGS cells (Figure 4d). Nucleotide sequence analysis revealed a single nucleotide mutation at codon 545 of PIK3CA in MKN1 and AGS cells (E545K and E545A, respectively, Additional file 11c), which suggested that AKT is potentially activated in these cells through mutational activation of PIK3CA. However, in MKN1 cells, phosphorylation of AKT was reduced by KRAS knock-down under both the normal culture condition as well as after serum stimulation (Figure 5b), which suggested that the overexpression of wild-type KRAS might also be involved in enhancing the activation of AKT. Among the four genes that localized to the minimal amplicon at 12p12.1, the knock-down of KRAS caused a significant inhibition of cell growth in HSC45, MKN1 and AGS cells (Figure 5c, P < 0.005, t-test), whereas knock-down of the other three genes had no effect. There was little growth inhibition observed in NUGC4 cells, in which KRAS is neither amplified nor mutated. These results suggested that KRAS is the driver gene responsible for the promotion of proliferation of cancer cells harboring 12p12.1 amplification, and the other three genes are likely to be passenger genes on the amplicon. KRAS knock-down HSC45 and AGS cells exhibited a reduced accumulation of S-phase cells (Figure 5d), whereas KRAS knock-down had no effect on S-phase accumulation in MKN1 cells. Taken together, these results suggested that the amplification of KRAS is involved in the promotion of cancer cell growth through the activation of the p44/42 MAP kinase pathway, and in part through activation of the AKT pathway. To determine the role of KRAS in primary gastric cancer, we used qPCR to analyze KRAS amplification in genomic DNA derived from primary gastric cancer specimens. We screened 86 specimens, and found amplification of the KRAS locus (8–50-fold) in four of them (4.7%) (Figure 6a). Furthermore, mutations were not detected in KRAS or PIK3CA (exon 9 and 20) in these four tumors by nucleotide sequencing analysis of the PCR products or clones of the PCR products (data not shown). With the exception of tumor C, histopathology of the tumors indicated that they were generally of the diffuse-type, according to the Lauren's classification system , and there were no significant differences in clinicopathological features between KRAS-amplification-positive and -negative tumors (Additional file 2). Immunohistochemical analysis specifically detected KRAS in cancer cells (tumor D, Figure 6b), whereas the expression of KRAS in adjacent noncancerous cells was below the level of detection. Gene amplification coincided with intense KRAS immunoreactivity in the same tumor samples, which suggested that gene amplification results in the overexpression of the KRAS in primary gastric cancer. Amplification of KRAS in primary gastric cancer. (a) Quantitative PCR analysis of genomic DNA from primary gastric cancer specimens was carried out using primers specific for regions within and flanking the KRAS locus. DNA copy number relative to normal diploid leukocyte DNA is plotted onto the corresponding chromosomal nucleotide position in megabases. (b) KRAS is preferentially expressed in gastric cancer cells with KRAS amplification. Hematoxylin-Eosin staining (left) and immunohistochemical staining with an anti-KRAS antibody (right) of gastric cancer tissue (tumor D). Upper panels: poorly-differentiated adenocarcinoma cells with submucosal invasion. Lower panels: adenocarcinoma cells adjacent to normal pyloric glands. In this report, we described a novel method, termed DGS, of detecting copy number alterations in the human genome, which is based on the analysis of short fragments of genomic DNA generated by restriction enzyme digestion. Although DGS is modeled on the basic concept of DK, we developed a modified tag preparation technique that involves single restriction enzyme digestion without PCR to minimize complex handling regimes and potential biases generated by PCR. Our relatively small-scale sequencing of approximately 5000 tags successfully detected discrete 500-kb amplifications of KRAS and CACNA1C in HSC45 cells, which were not previously reported in an independent experiment using BAC-based aCGH analysis . To date, however, this DGS method has some limitations as compared to DK and other methods. First, the resolution of DGS using short MboI tags is lower than DK due to the difference of the theoretical number of virtual tags produced by restriction digestion. The number of virtual tags in our analysis (approximately 394,000 virtual tags in the range of 30 to 60 bp) was less than that of DK (approximately 731,000 tags) . Thus, while the current pilot study demonstrates the feasibility of using DGS to estimate copy number using a simplified tag preparation method, additional studies are needed, using different or combinations of restriction enzymes to produce more short tags, to improve the resolution of DGS. Second, DGS method has several limitations involved in labor, cost, and amount of material: (a) this method needs the generation of two rounds of plasmid libraries and the propagation of plasmid libraries, (b) this method costs higher than microarray platform and DK, (c) a large amount of starting material DNA is required. Recently, the use of single nucleotide polymorphism (SNP) arrays for the detection of allele-specific copy-number alterations at high resolution using 906,600 SNP probes has been reported . Because DGS and DK do not rely on pre-designed probes, they are "open" platform techniques. For example, DK could be used to explore exogenous pathogenic DNA in infectious or neoplastic states . However, tag-counting methods, including DGS and DK, have similar limitations. First, they generally do not estimate allele-specific copy number, which SNP array analysis does. Second, the number of sequence reads, which is to say, the depth of sequencing, affects the sensitivity and the resolution of tag density profiles. The results of simulated DGS indicated that DGS using deep sequencing will have a higher level of sensitivity in detecting subtle copy-number alterations. However, even in reports of successful DK [14–17], the depth of sequencing was less than 0.3 (when the theoretical number of unique virtual tags was defined as 1.0), partly due to practical limitations, such as the low through-put rate and labor intensive methods required when using standard sequencers . In the next step of improving DGS, DGS should be combined with the next-generation sequencing technologies . The recent introduction of instruments capable of sequence millions of nucleotides in a single run is changing the landscape of human genetics. By applying next-generation sequencing technologies to DGS, it should be possible to simplify the protocol and improve efficiency and resolution by bypassing the multi-step process of tag concatemerization, as well as conserve starting genomic DNA. With some next-generation sequencers, tag preparation by restriction digestion might generate more reproducible DNA fragmentation than current random-shearing approaches [35, 36]. 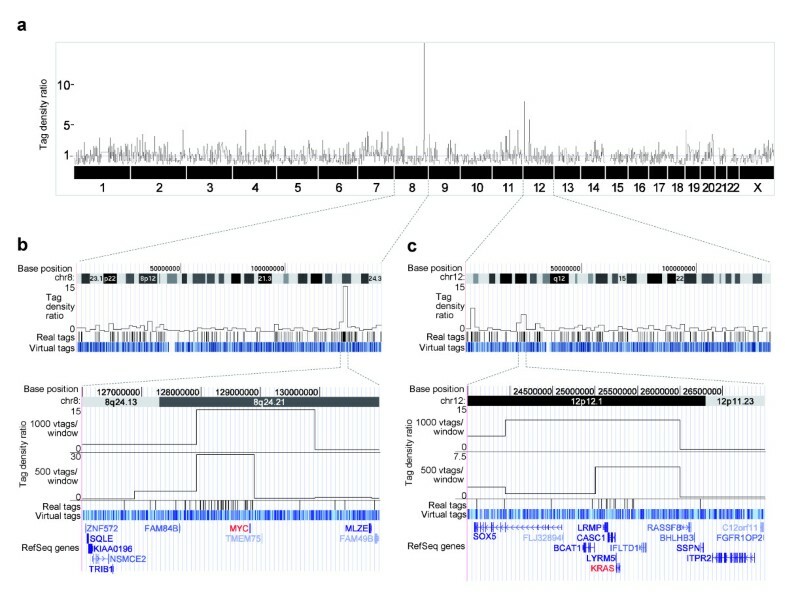 Gene amplification of KRAS with or without mutation has been described in a limited number of cases, including lung, gastric, pancreatic and rectal cancers [37–40]. More recently, aCGH analysis of various primary tumors, including lung, colorectal, pancreatic and gastric cancers, gliomas and testicular germ cell tumors, also detected amplification of chromosome 12p [41–46]. In this report, we provided evidence that, while rare in colon and pancreatic cancers, the incidence of KRAS gene amplification (greater than 4-fold) is increased in gastric cancer, and is responsible for KRAS activation. Using MKN1 cells as a model system, we investigated the mechanism by which KRAS amplification contributes to the growth of primary gastric cancers that lack mutations in KRAS. Immunoblot analysis and knock-down of KRAS in cells provided evidence that KRAS gene amplification results in KRAS activation in the absence of mutation. To our knowledge, this is the first report to demonstrate a potential relationship between gene amplification of endogenous wild-type KRAS, activation of KRAS signaling pathways, and cell growth in gastric cancer. In general, less than 10% of wild-type and over 50% of mutant RAS is in the GTP-bound state in cells [47, 48]. Therefore, it is likely that amplification of endogenous wild-type KRAS coupled overexpression in the MKN1 cells induces a biological effect that is similar to the effect of single-mutant alleles of KRAS. We also found that while serum stimulation induced the activation of overexpressed KRAS and p44/42 in MKN1 cells, in cells that harbored amplified mutant KRAS, KRAS and p44/42 were constitutively activated. Thus, amplified wild-type KRAS might provide a growth advantage to cancer cells, not only by upregulating the basal cell growth, but also by conferring adaptability to changes in the environment, such as availability of growth factors and nutrients. Further studies will be needed to investigate potential functional connections for these correlations. The KRAS gene status of tumors is currently of great interest, because KRAS mutations are linked to the response to anti-epidermal growth factor receptor (EGFR) therapies. Panitumumab and cetuximab are antibody-based drugs that inhibit EGFR, and are currently used in the treatment of colorectal cancer . However, several groups have reported that KRAS mutations are significantly associated with lack of response to cetuximab or panitumumab in patients with advanced, chemotherapy-refractive colorectal cancer [50, 51]. In gastric cancer, EGFR is a promising target since it is frequently overexpressed [52, 53], and clinical trials of cetuximab in the treatment of gastric cancer are ongoing [54, 55]. Our results showing that overexpressed wild-type KRAS is involved in the activation of downstream signaling pathways that govern cell proliferation indicate that the amplification of KRAS might be of clinical significance in predicting response to cetuximab or to panitumumab in gastric cancer. Prospective studies are needed to determine the efficacy of patient-specific EGFR-targeted therapy based on KRAS amplification and mutation status. We demonstrated that DGS is an efficient method of identifying DNA copy-number alterations. Using DGS, we investigated the role of KRAS gene amplification in the overactivation of KRAS in gastric cancer. Future studies using a larger cohort of gastric cancer specimens are needed to elucidate the clinical, diagnostic and therapeutic significance of KRAS amplification and overexpression. We thank Drs. Sam Thiagalingam and Joseph F. Costello for critical reading of this manuscript. We also thank Tomoko Takahashi, Miho Higuchi, Reia Hosokawa, Tetsuya Fujii, Masami Ashida, Mutsumi Toyota and Kyoko Fujii for their excellent technical support. Grant support: Grants-in-Aid for Scientific Research on Priority Areas from the Ministry of Education, Culture, Sports, Science, and Technology (MT, YS, KI and TT) and Industrial Technology Research Grant Program from New Energy and Industrial Technology Development Organization of Japan (HM). HM performed molecular biological experiments including DGS, and wrote Perl scripts and the paper. FA, HA, RM and HT performed in silico genome analyses and constructed the tag database. YS and MI performed real-time PCR. LK performed Southern blotting. MT and HS extracted genomic DNA and performed sequencing. KY provided gastric cancer cell lines. MF, MH and MK provided primary samples and clinico-pathological data. SVS designed in silico DGS simulation and performed statistical analyses. KI, YS and TT conceived, coordinated the study and revised the paper. All authors read and approved the final manuscript.